Cologne Of The Wild is a very popular exotic spray cologne developed exclusively for man's best friends... dogs, cats, ferrets, rabbits, and virtually any fur-bearing animal. Its daring, mysterious scent makes all pets even nicer to be with. Cologne Of The Wild is formulated with the finest ingredients, utilizing alluring fragrances from around the world, and like all of Professional Pet Products it meets their exacting standards. This cologne is for male or female. It is highly popular with groomers and personal pet owners. This cologne is also very strong so very little is needed at one time. It smells very good! 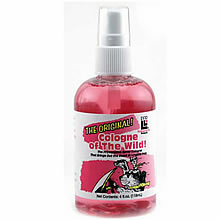 Us dog owners here in our office use Original Cologne of the Wild and Espree Parfums.